Considering purchasing the Inno Pocket Roll? Have questions? Ask people who've recently bought one. Do you own the Inno Pocket Roll? Why not write a review based on your experience with it. Does the job, looks great once you have people on the dance-floor, it is noticeably dimmer than other lights I have with the same power of leds in them which is a bit of a shame, but a great little addition if you just want something to finish off a lighting rig you already have. Yo do need at least two, one on its own would be no good. 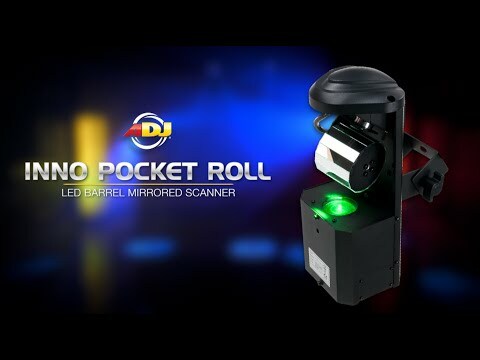 I shopped around for a while and decided to invest in an Inno Pocket Roll as my first effect light purchase. For the money, I've been impressed by its solid construction and calibre of built-in functionality. The UC IR remote is also of use when changing strobe mode, blackout etc - sometimes this does not register with the fixture's receiver but is not a large issue. The gobos are fixed colour (no separate colour wheel) but for the money and the small footprint of this thing I don't see how it would be possible to accommodate. Overall a great high energy light that throws light everywhere - buy 2 and master slave them with pan -invert for an even better effect! We bough a pair of these, brilliant lights. Bigger venue such as a big sports hall they are a little lost, but for our normal hotels we work fantastic throws light every where. Very compact, great value for money. This is a very compact light which makes for easy transportation and set up. Perfect for mobile DJs. Output is great for the price and the barrel mirror gives a really good spread of light. My order arrived the next day so could not have been any faster. Always a great service from DJ Kit. Its a cool light but it really shines with haze or fog but it looks cool in master slave with pan inverting but overall it is a cool light. Really impressed with these lights. Bought 2 and do not disappoint. Great effect especially with smoke. Bright easy to program. When it comes to a solid build quality ADJ don't disappoint. 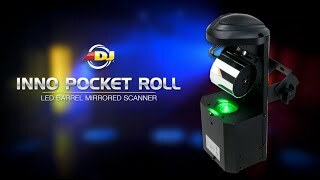 The construction of the Inno Pocket Roll is all metal except for the top part closest to the roll mirror that is a hard plastic. The light output is bright, the gobos are sharp and the colours are beautiful. The roll throws light all over the place, it's perfect for any DJ looking for a couple of fixtures to cover a dance floor or provide ariel coverage. For the price I think it would be difficult for any DJ to find something that closely resembles this product and it's features. It has multiple show modes and excellent functionality. I would definitely recommend this fixture to friends, colleagues, mobile DJ's or venues of 200 capacity. It's cheap, affordable and well built. Be it DMX or Sound Active, ADJ delivers everything you need packed into one fixture to put on a, awesome light show. Great light. Is bright and works well on just sound to light. Buy a pair!! Looks good. A good little unit for the money. Fairly bright but would benefit from being a bit brighter. Better with haze, smoke, fog etc. As has been said before it's light and compact, easy to hang, easy to set up but would be better if it had a separate gobo wheel. An excellent addition to any mobile DJ. Better with a pair or four easy to set up as a single or pairs 12 auto run programmes with sound to light effects or the usual DMX channels. With the quick service from DJKit and benefits you can't go wrong. Great lights, small compact, lightweight. Excellent little light for the money , ideally need at least 2 to get the best from them , add a hint of smoke and away you go. The Inno Pocket Roll is a great product! easy to setup and operate with no problems. it's small compact design makes it easy to fit in a small carry bag for protection, i use the Accu case AC-100 which fits nicely. This is a really compact and lightweight fixture which is great for any mobile DJ out there. It is bright and affordable and a few of these will make a perfect lightshow! This has to be one of the best rollers out there at this price!!! 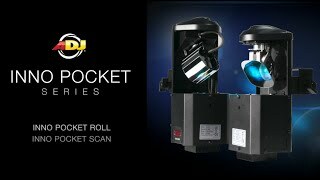 Seen a video for Inno Pocket Roll online or have you own video? 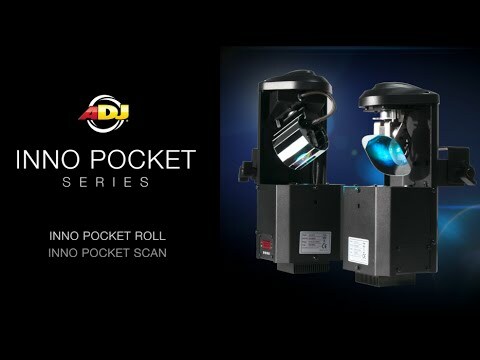 Check out Inno Pocket Roll on DJkit.com!